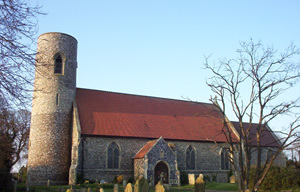 The Parish of Belton with Browston is situated in the south west of the Borough of Great Yarmouth, to the east of the River Waveney. 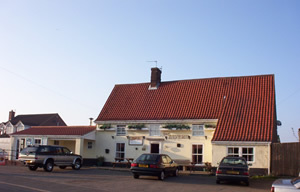 The larger village of Belton is separated from its smaller partner of Browston by the A143 which runs from Great Yarmouth to Beccles and beyond. The joint Parish has over 4500 inhabitants in over 1650 properties, all but 50 being in Belton. Until 1974 Belton was in Suffolk, in the Lothingland Rural District but was transferred to Great Yarmouth and the county of Norfolk in local government boundary reorganisation. (from 1858) the railway was closed in the Beeching era in 1959. From the 1970s rapid development saw the population escalate and virtually all the market gardens were bought up for housing land with most building completed by the early 1980s. Burgh Castle, Bradwell, Browston, Fritton and St. Olaves areas. holiday interests in adjoining villages, virtually all employment is outside the village, either in Great Yarmouth itself or in surrounding towns. past it also had the tourist attraction, Belton Gardens, laid out behind it. The Tavern also has a Fish and Chip shop on the same site. constructed in 2010 on the outskirts of the village which is managed by the Parish Council and is currently a base for the very successful multi teamed Bohemians Youth Football Club. from demolition by a local businessman in 2005 ( originally simply known as the Institute the foundation stones were laid as far back as 1896). There is also the Moorlands School and the Church Annex. Since I arrived here five months ago, much has been said to me personally and written about anonymously in the media regarding the church building in Belton not being used for Sunday worship. building site inevitable with the installation of the a new heating system and a new floor. The plan is to have the new floor laid, new lighting and electrical sockets installed and the heating working by the date of the Family Carol Service on Sunday 18th December. raised through trust funds, grants and the financial giving of the church community. We still have to raise approximately£12,500 to complete the work; so the support of the village community would be much appreciated. hopefully from Christmas onwards. Sometime in the new year, depending on the completion of the work and weather conditions, I plan to introduce a traditional service of Holy Communion once a month on a Tuesday morning; which will take place in the chancel. to Gift Aid your donation it will allow us to reclaim tax of 25p for every £1 from the government. A Gift Aid form is available if you are prepared to spend a moment completing it. area Borough Councillors and one County Councillor. There is an independent monthly news magazine produced in the village, “Village Voice” and this circulates in Belton and the surrounding parishes It is produced by board made up of a group of parishioners with the intention of ploughing any surplus funds back into the community in the form of grants to local organisations. small but very old orchard which is owned by the villages Bell Lane charity but managed for the community by the Parish Council to ensure that it remains an open space. With reference to the above photographs does anyone have any information about the production or issue of White China Plates and Saucers (and presumably cups although none are known). 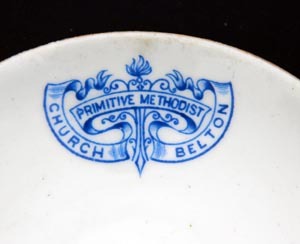 They were produced with the emblem Belton Primitive Methodist Church on them.? There are a few at the John Green Institute. Any information on their history would be appreciated. We know that the Primitive Methodist Church (or Chapel) stood on Station Road North, between the Wild Duck Holiday Park and what used to be Budgens Shop (formerly Berrys).